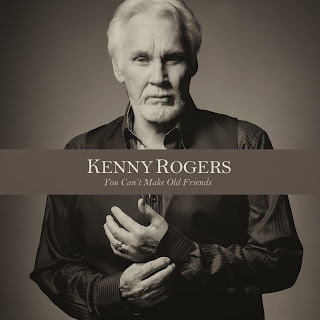 NEW CRITICALLY ACCLAIMED ALBUM "YOU CAN'T MAKE OLD FRIENDS"
NASHVILLE, Tenn. – (October 16, 2013) – Legendary music icon Kenny Rogers has just landed his 22nd Top 10 Country album with the Billboard debut of You Can't Make Old Friends at #9 via Warner Bros. Records. In celebration of the album release, Rogers did a blitz of media appearances that kicked off with an interview and performance on Jimmy Kimmel Live! on October 2nd. Rogers was also featured on Hallmark Channel’s Home & Family, Extra!,GAC’s Backstory, CBS This Morning, Fox & Friends, Bloomberg TV, Kathie Lee & Hoda on The Today Show, and The Rachael Ray Show. Rogers can be heard performing several new songs from the album live on SiriusXM’s Artist Confidential airing on Prime Country this weekend. He can also be heard guest hosting the nationally syndicated radio program After Midnite all this week through Sunday, October 20th. With a collaboration of producers, including Kyle Lehning, Warren Hartman, and Dann Huff, You Can’t Make Old Friends is Rogers’ first country album since the release of Water & Bridges in 2006. Rogers considers this release the most varied and complete album of his lifetime. "I can honestly say this may be the best album I've ever recorded,” said Rogers. “I’m thrilled with how it turned out. I wanted to really stretch my boundaries and do something a little different. There are songs on this record that I would normally sing, and then there are songs I would normally never even listen to. In this business, you do albums to both grow artistically, and for the sheer love of music. We chose what I think are the most diverse and best songs I've ever had access to." A trailblazing recording artist, vocalist, and entertainer, Rogers has sold more than 120 million records worldwide and recorded more than 65 albums during his illustrious 56 years in show business. Rogers has charted a record within each of the last seven decades and scored a hit single in the past six. He was the first country artist to consistently sell out arenas and quickly became a pop superstar as well – his 28 Billboard Adult Contemporary Top 10's is fourth-best all time among men, trailing only Elton John, Neil Diamond, and Elvis Presley. Rogers has recorded 12 No. 1 albums and 24 No. 1 hits – “The Gambler,” “Lady,” “Lucille,” “Coward Of The County,” and “Islands in the Stream” (with Dolly Parton) among them. His Greatest Hits album has sold over 24 million copies worldwide to date. He is the RIAA’s 8th best-selling male artist of all time with one Diamond album, 19 Platinum albums and 31 Gold albums.